Cardboard art in the "Corrugation Nation" exhibit at the Waterfall Arts in Belfast. Geoffrey Leighton works on his video installation titled "Moving Day" at the Waterfall Arts in Belfast on Tuesday. Most days, Waterfall Arts on High Street in Belfast buzzes with activity, from violin lessons to karate; pottery classes to birthday parties. Drive past the building and it doesn’t look that big, but go inside and it’s deceptively spacious — large enough to house the many galleries and offices of Waterfall Arts and additional space rented to a variety of people. The organization, located in the old Anderson Elementary School since 2006, provides a home for artists, musicians, poets, foodies and other creative people in Waldo County. But visual arts are its primary focus, and this weekend a new exhibit opens at Waterfall Arts that encapsulates much of what the organization is about. 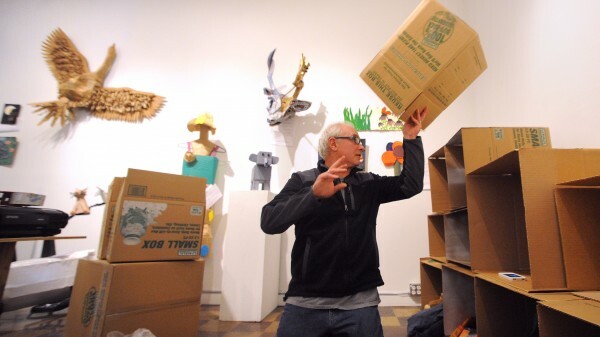 The open call exhibit, “Corrugation Nation,” shines the spotlight on an everyday material, corrugated cardboard, and gathered art from anyone and everyone that wished to contribute in Maine and out. It’s not the first open call show Waterfall Arts has done — the previous one, which requested art that was no larger than 10 inches by 10 inches, was a success — but “Corrugation Nation” is poised to be its biggest. 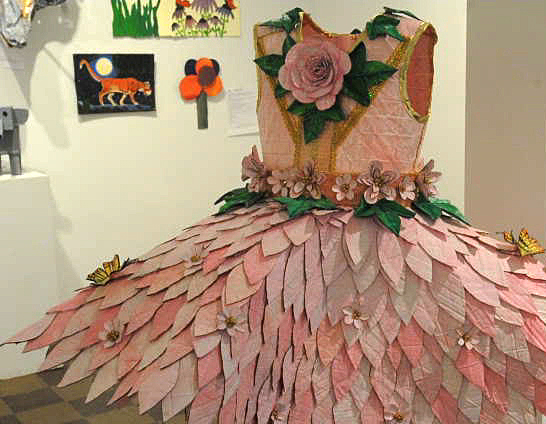 In the week before the show opened, a scale cardboard model of Yankee Stadium arrived, designed by Jon Moro of Rockport; a huge cardboard goose flew into the gallery, created by Camden High School student Tessa Isis Bahoosh; and even a beautifully designed cardboard dress, by Robin Horty of Camden, was put on display. Some of the art is by seasoned artists whose work regularly appears in galleries while others are created by elementary school students. In all, several hundred pieces of art will be included in the exhibit. “Corrugation Nation” has taken over much of Waterfall Arts’ gallery space, though its basement galleries still are undergoing some surprise renovations. In early March, Waterfall Arts staff were dismayed to find a massive water leak in the basement that destroyed floors and damaged furniture but mercifully didn’t destroy any art or equipment. Though the flood meant that parts of the building were off-limits for artists to work or display in, staff quickly have fixed up a ceramics studio and a gallery space and are in the midst of repairing the rest. The Anderson School was built in the 1950s and though it’s a large space for a community arts organization such as Waterfall Arts, it’s not exactly an environmentally friendly building. Heating costs are through the roof and other energy consumption is extremely high — which is just one of the reasons that Waterfall Arts is devising a plan to make the nearly 70-year-old building more green. In December, Waterfall Arts received a $10,000 Challenge America Fast Track Grant from the National Endowment for the Arts to facilitate a major assessment of the building. With the information gathered from the study, Waterfall Arts hopes to move forward later this year with the first phase of renovations. In the meantime, they’ll work around the water damage and energy costs. “Corrugation Nation” will be on display through May 18, at which point much of the cardboard art in the show will be auctioned off. Workshops, events and new exhibits for the late spring and summer will be announced later in the month. On April 28, the facility will be a venue for the Belfast Free Range Music Festival. In the past, Waterfall Arts has hosted everyone from renowned kinetic sculptor Arthur Ganson to 4-year-old Belfast artist Eliot Bee Andrews and her fairy garden. That diversity is exactly the kind of thing that Piscuskas hopes to encourage year-round.